IT DOESN’T NEED TO TURN BACK TO THE MINIMUM SCALE VALUE AFTER BEING USED. The wrench works with a “variable arm clicker mechanism”. 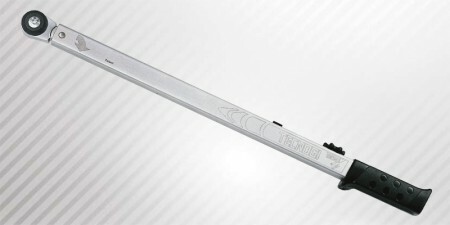 Torque variations are obtained not by screwing or unscrewing a spring (the critical component in a standard click type wrench) but by a variation of levers positions. The spring inside works always in the same condition, independently of torque selected. This innovative system guarantees endurance and stability. With reversible 72 teeth ratchet head, universal fittings 9×12, 14×18 or16 mm spigot end. With graduated scale in Nm and Lbf.ft or pre-set (the desired torque must be set using a torque analyzer). Dual signal when the set torque is reached: acoustical click and effort decrease. Guaranteed accuracy ± 3% in accordance with EN ISO 6789:2003.